IPv4 and IPv6 are nothing but internet protocol (IP) and known as Internet Protocol Version 4 (IPv4) and Internet Protocol Version 6 (IPv6). These days most of the systems have IPv6 enabled as IPv6 is capable to handle more network traffic than IPv4. IPv6 was developed by Internet Engineering Task Force (IETF) to overcome on the issues with IPv4. IPv4 and IPv6 also provides the System address and location of the system on network. Sometimes we need to test few applications in IPv4 as well as in IPv6 enabled computers to confirm our newly developed applications are working fine in both the systems which have IPv4 or IPv6 or both are enabled. If the application runs fine in IPv4, not necessarily runs as expected in IPv6 and vice versa. To perform this task if the system already have IPv4 enabled we can change the setting and could enable IPv6. Similarly we can switch from IPv6 to IPv4. 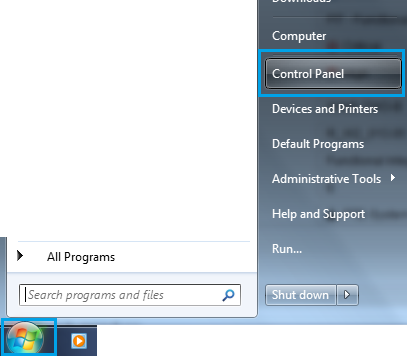 1) Click on Start and the click on Control Panel. 2) Click on Network and Internet. 3) Click on Network and Sharing Center. 4) Click on Change adapter settings shown on left side on the screen. 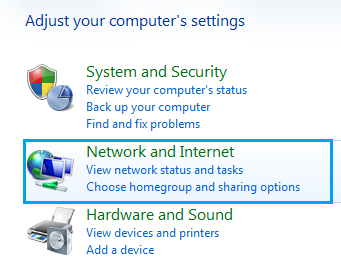 5) If you are connected with LAN (Local Area Network) then right click on Local Area Connection. If you are connected with Wireless then right click on Wireless Network Connection. 6) Click on Properties. It might could ask you to enter password. Please enter your system password and click OK.
By default either IPv4 or IPv6 or both will be enabled. 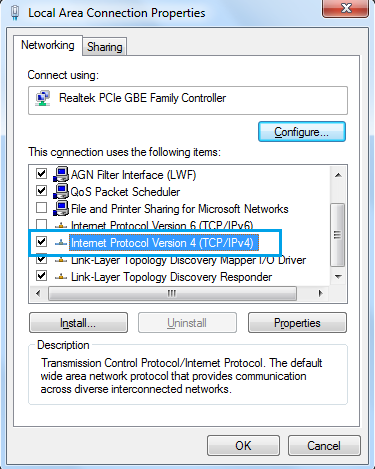 Here IPv4 is enabled.On this properties window you can select or deselect the checkbox of IPv4 or IPv6 to enable or disable. 8) Select the desired option and click on OK will enable or disable the IPv4 or IPv6 settings for your network based on the option that you have selected. Hope this will help you to change or switch IPv4 and IPv6 in your system. Hmm. After i disabled IPv4 and pressed “ok” my internet had no access to the internet… Had to enable it again in order to have internet connection. And yes i had both IPv4 and IPv6 enabled…. has your router ipv6 enabled? I believe the first hop needs to support the protocol. If other intermediary links between your router and the destination have only ipv4 support, it can still wrap your traffic into ipv4 packages and unwrap at the end, but if you disable ipv4 on your device, then I assume your device itself is unable to communicate via ipv4 with your router. you might want to reset your computer for the new setting to work on some systems.